URTICÁRIA – WHAT IS URTICARIA? URTICÁRIA – WHAT ARE THE SYMPTOMS? CHRONIC URTICARIA – HOW TO DIAGNOSE? ANGIOEDEMA – WHAT IS ANGIOEDEMA? ANGIOEDEMA – WHAT ARE THE SYMPTOMS? ANGIOEDEMA – WHAT ARE THE TYPES OF ANGIOEDEMA? ANGIOEDEMA WITHOUT URTICARIA -What are the types? ANGIOEDEMA WITHOUT URTICARIA -How is diagnosis made? Anaphylaxis is a serious, life-threatening allergic reaction. 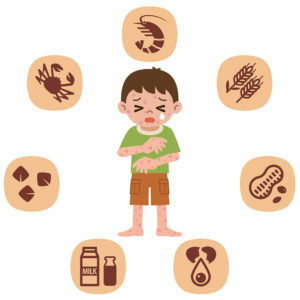 In most cases, the onset of anaphylaxis symptoms is quickly seen, within 5-30 minutes after being exposed to the allergy-triggering substance, called allergen. In an anaphylactic response, the immune system – responsible for protecting our body – shows an exaggerated reaction to a given substance (which is harmless for most people), causing anaphylaxis. The most common causes of anaphylaxis are food, insect bites, and drugs. When patients’ cardiovascular and neurologic systems are affected with reduced blood pressure, unconsciousness, or, also, edema of the glottis with suffocation, anaphylaxis is called anaphylactic shock, which represents an extremely serious condition. Anaphylaxis is a medical emergency and therapy must be implemented right after diagnosis is established. The first line of treatment consists of keeping respiratory system and blood flow working, in addition to adrenaline injection. After discharged from emergency, an anaphylaxis patient must be referred to a specialist, who will take a detailed history, and make clinical and laboratory tests, if required. Keep documents or wear bracelets describing the substances to which you are allergic. These are critical steps for anyone who had ever experienced an anaphylaxis episode, because these patients are more likely to have recurrences. © 2018 | GUIA Grupo de Urticária Informação e Apoio. All rights reserved.